Want Land? Look here! A Rare Find! Quiet Country Mornings! Peace & Serenity here!! 1 Acre of Land-Paved Road/ On A Cul-de-sac! Leave the Hassle and Enjoy! Newer Carpet In Living Room/Hallway. 3 Bedrooms, Master is Private with Walk In Closet! Big Kitchen with Island, Eating Space & Bay Window. Easy Care Laminate Flooring. Pantry in Laundry Area! Windows Are Newer! 2x6 Construction! New Roof on house/garage Aug.2018! This Price & Location Will Set "Smart" with any Buyer Wanting Land- With A Great Home! Enclosed Patio! 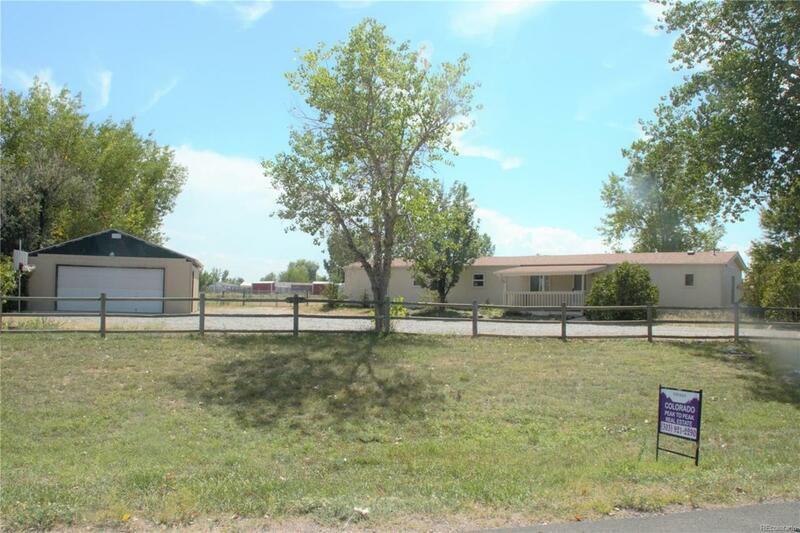 Fenced Pasture/ Play House / 2 Sheds, PLUS a Large Detached Garage! Great Access to Shopping/DIA & Denver!